Whenever I travel, I always end up overpacking in every possible way; clothes, shoes, makeup, you name it. But the one place you can’t overpack: in flight skincare items. With there being a strict enforcement on the size of liquids and bags for liquids being brought on a flight, I’ve had to move some essential skincare items of mine into my suitcase. Airplanes leave your skin feeling dry and just overall dull (or at least my skin!) So after traveling a few times in the past few months, I’ve narrowed it down to a select few items that keep my face feeling fresh and moisturized during a flight, whether your wearing makeup or not. On a plane, there’s not really room in the bathroom to wash your face with soap and water, so the simple solution is face wipes. My faves are the Yes To Blueberries Cleansing Towelettes. They’re anti-aging and super moisturizing and I can usually take off all my makeup with just one single towelette. They also come in a travel size, which makes them great to bring on a plane. You can use these in the bathroom or just in your seat and they don’t have to be squeezed into your liquids bag, so that leaves room for other necessities! After cleansing your face, The Evian Brumisateur Facial Spray is the perfect way to moisturize or add extra moisture before a cream. Since it’s a spray, you don’t need to touch your face, which makes it a quick and easy way to moisturize, especially if your sitting in your seat or in a rush and don’t have time to cleanse your hands before touching you face. If you’re just on a short flight and you won’t be washing your face but want to just refresh your skin, this facial spray is a great way to do that and maintain hydration throughout the flight. It’s so easy to use and the travel size is perfect for a carry-on! If you’re wearing makeup, light or heavy, you can spray this on your face to refresh your makeup before getting off the flight. These two products are absolute essentials for me from now on because they condense my must-do skin care into two small, easy, and convenient products to keep my face feeling and looking clean, fresh, vibrant, and soft while traveling. This quick and easy skincare routine isn’t just great for air travel, but also for road trips, long train and bus rides, and even after the gym if you don’t have the time or place to wash up. You don’t even need a bathroom or a mirror to use either product! 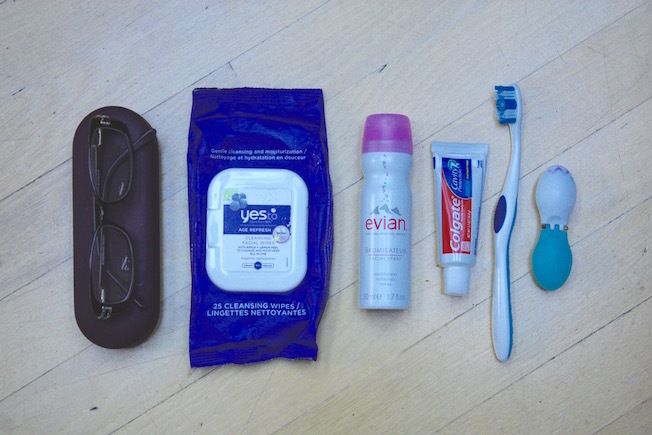 Then of course, I bring my contact case, glasses, toothpaste, and a toothbrush to give my eyes a break and freshen my mouth, especially for a long flight. I hope this post helped you, whether you’re flying tomorrow or planning your next trip. Let me know in the comments below if you would like me to post my quick and easy travel makeup routine that would, of course, go hand in hand with these skincare essentials!